It’s been well known that black can be a powerhouse, as far as colors go. It’s bold, distinguished and classic. And yet, gray has a power all on it’s own. It can blend well with many other colors, it can enhance an ensemble, and there are numerous shades to work with it. While many women (and men) will gravitate to black or neutrals or bright colors, I find myself being pulled towards gray time and time again. As you all know, there are both warm and cool grays. And, I love them both! Cool grays are a lighter shade, like this Heather gray . . .
And can work well with blue’s and green’s . . . But I decided to stay monochromatic keeping it all light and heathery. The only heaviness I added was in the knitted texture of the skirt and sweater vest. I think you may be seeing me in quite a bit of gray this season. What about you, are you a gray powerhouse? If you want to see how others are wearing their gray head over to Adrienne’s and Jill’s for their monthly HIWM series. I’m also joining a fabulous group of women for their monthly My refined Style link up. A beautiful look, I love this soft shade of gray, and the knit so soft. Thank you Josep-maria, I’m quite loving this soft shade this year, be ready to see more of it. You already know I ADORE this monochromatic look from IG. I don’t own much gray in my closet and have been wanting to add more. Great year to add more grey to your extensive wardrobe my friend, it’s everywhere. You look fantastic in these greys, and the textures make this a warm AND cool look. I really like greys but curiously I don’t have many, except all over my head. It’s harder to find greys and whites in thrift shops because they must be pristine to look good. I’ll keep looking! 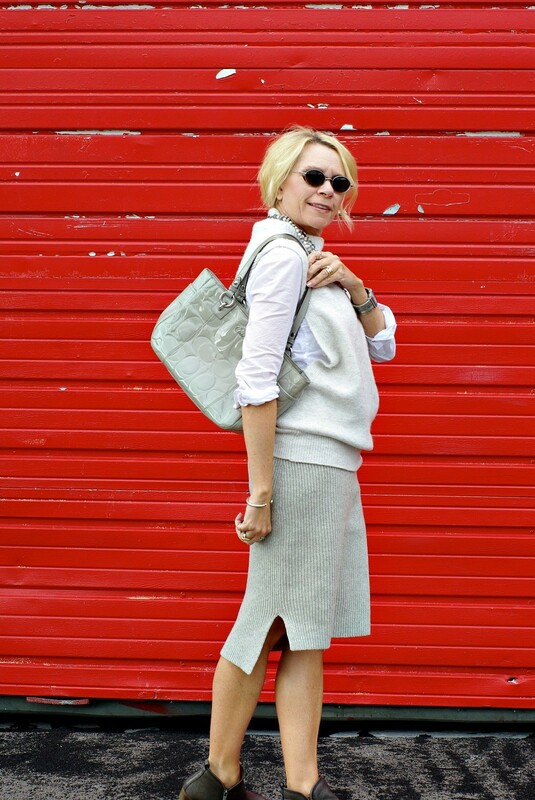 Believe me, if my head looked like yours in grey it would definitely be joining this monochromatic look. I adore heather grey, it is a lifelong love! You look casual and chic in this, love the deep color of the bootie, and the great necklace !! Thank you Elle, this heather grey must be made for us blondes, right? I am not a person for grey. sometimes it suits me (lighter greys) but usually it washes me out. You are a clever girl in adding different texture items to your outfit. I know that is the way to do it, but I only know that in theory. Cannot put it in practise. Here you go again, you silly lady. You do a much better job of putting things together than you ever give yourself credit for. You’re looking gorgeous, chic, and fab in gray, Dear! Charcoal gray works best for me, but I wear all the shades of gray! Thanks so much for linking up & I’d love to see your pretty face back each week! Thank you! And thanks for your wonderful weekly get together. Great outfit! I like grey; there are so many shades to choose from! Lovely necklace, and I love the textures of your sweater, skirt, & bag. Everything works great together and looks interesting. You are so kind Andrea, thank you! Trina, I thought this look worked so well on you and the kicky booties just make it! I have chosen you as one of my featured looks from the My Refined Style linkup. I will be featuring you on my Monday fashion post. Well, how sweet are you? I feel truly honored. Thank you so very much.